A federal judge on Friday rejected a settlement proposal put forth by Apple, Google, Intel, and Adobe that would have seen the Silicon Valley giants pay $324.5 million to end a long-running class action lawsuit alleging that they conspired to suppress salary inflation among workers. 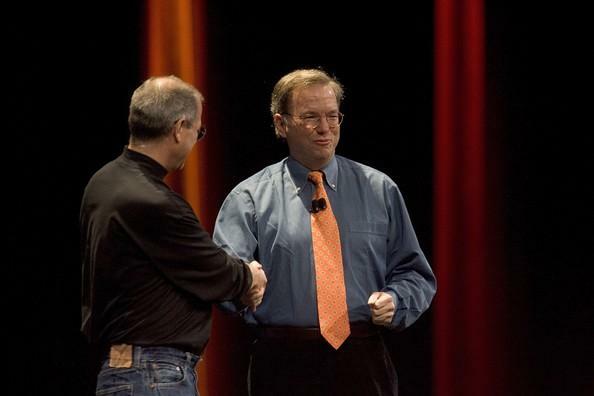 Steve Jobs and Eric Schmidt during the iPhone's introduction at MacWorld in 2007. The rejection comes nearly three months after the settlement —in which each affected worker would have received between $2,000 and $8,000 —was first submitted for the court's approval. Presiding Judge Lucy Koh ruled that offer was not significant enough when compared to the settlement previously reached with Intuit, Pixar, and Lucasfilm in the same case, according to Bloomberg. "The remaining defendants should, at a minimum, pay their fair share as compared to the settled defendants, who resolved their case with plaintiffs at a state of the litigation where defendants had much more leverage over plaintiffs," Koh wrote. A number of Silicon Valley employees filed suit against Apple, Google, and the rest in 2011, alleging that the companies had illegally agreed not to hire each other's employees, effectively reducing competition and causing wages to stagnate. Among the reams of evidence submitted in the employees' favor was an email from late Apple CEO Steve Jobs to Google cofounder Sergey Brin in which Jobs threatened "war" against Google over the search company's hiring of Apple engineers. Were the suit to continue to trial, the plaintiffs could stand to win as much as $3 billion —an award that could be trebled on antitrust grounds. A similar lawsuit brought against the same firms by the U.S. Department of Justice was settled in 2010.